With every birthday, it gets harder and harder for our skin to conceal our age. Wrinkles, age spots, sagging, and looseness of the skin are the telltale signs of aging. An understanding of how skin ages can help us to take the necessary preventive measures to keep it looking young. 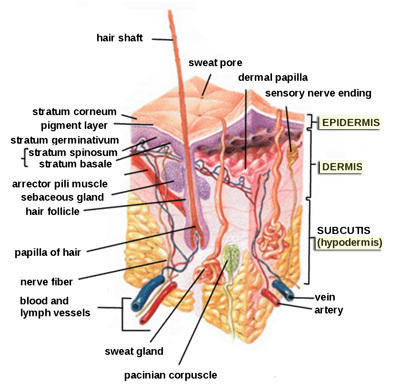 The skin consists of the epidermis, dermis, and the hypodermis, as shown in the upper figure. The epidermis, the outermost layer of the skin, contains dead, hardened cells that protect the body from the outside environment. The next layer is the dermis, which contains collagen and elastin that provide the skin with elasticity and a plump appearance (Suszynski). Last is the hypodermis, which mostly consists of fat (Your Health Library). Wrinkles form in either the epidermis or the dermis, and their morphology varies depending on the layer in which they are formed. Each day, our skin cells die, shed, and regenerate. When we are young, this process occurs very quickly, but as we age regeneration of skin cells gradually slows down, producing wrinkles and dullness of the skin (Suszynski). Furthermore, as we age, the epidermis begins to lose its ability to hold in moisture, leading to the appearance of fine lines in the skin’s surface (Siddons). Wrinkles also appear when the fat cells, or adipose cells, in the hypodermis start to decrease in number over time (Tannis 19). The vibrant appearance of the skin depends on the organization and quantity of collagen fibers in the dermis and in the junction between the dermis and epidermis. The fibroblast cells in the dermis are responsible for regenerating the collagen fibers, which are the main component of skin. However, as aging progresses, the activity of the dermal fibroblast cells decreases, and collagen regeneration does not take place as efficiently. Consequently, when the collagen fibers in the dermis and junction get disorganized and decrease in number due to deterioration, wrinkles begin to form and the skin sags (Siddons, Kalipaus). Together these intricate mechanisms lead to the visible consequences of deep wrinkles and a loss of firmness. However normal physiological processes are not the only ones responsible for the appearance of our skin. Sun exposure can increase pigment production in the skin, which in time leads to age spots (Suszynski). The sun’s UVA rays also break down the dermal collagen fibers and cause the fiber elastin to accumulate in the skin. Elastin accumulation leads to production of the metalloproteinase enzyme, whose function is to regenerate collagen after degeneration. However, since metalloproteinase does not function properly when synthesized after sun damage, the collagen fibers are not regenerated properly, leading to wrinkles in the skin (Nelson). Smoking can also impact the skin by causing dehydration and production of free radicals. The loss of moisture in the skin can promote formation of wrinkles. Free radicals also cause wrinkles by damaging protein and collagen in the skin (Ygoy). Since genetics alone are not at fault, it goes without saying that there are many measures we can take to prevent our skin from developing wrinkles and other blemishes. Cleaning skin regularly and using moisturizers can prevent the skin from looking dull and can reduce wrinkles. Moisturizers often contain collagen to replace degenerated skin fibers or antioxidants to prevent damage by free radicals (Nanotech Marketplace, Suszynski). Doctors also recommend using a vitamin A based cream to diminish the appearance of the wrinkles, stimulate the production of collagen, and reverse the thinning of the hypodermis. In addition, using sunscreen can prevent age spots and wrinkles caused by UVA-induced skin damage (Siddons). Taking good care of your skin is essential to maintaining your dermal health. It is never too early, or too late, to take care of the organ that can keep you looking young for years to come.